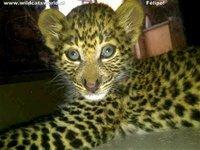 Meet Félipe, the new ambassador for our leopard conservation Project part II in SA. Félipe is born October 1st, 2012 and he will be the future partner of our female ambassador Feline, who is still enjoying the company of her brother Felix, for whom we hope to find a lovely girlfriend soon too. It will of course take at least another year, maybe longer, to introduce Feline and Felix to their new partners. In January 2013 we will already start building the new leopardenclosure at our Spotted Cats Conservation Project in SA where we already have projects for leopards, servals, black footed cats, caracals and lions.